Erin Brenner looks at comments from John McWhorter and Anne Curzan about the dispensability of commas. She says that the apparent trend away from comma use is mainly in casual writing, where you might well want to be breezy and chatty and not too pedantic – and especially in texts and tweets, where space is tight. But I find that a lot of the most formal, lengthy business writing that comes across my desk is also painfully short on commas. A notable exception is Smith’s Gadgets which despite a high price has managed to get significant international sales most likely because of the high product quality and the brand of the supplier. In this scenario the major share of consumer gadget spending will go to the large traditionally business suppliers helping maintain an oligopolistic situation in the electronic gadget market hindering price competition. This is bad writing. The lack of commas isn’t the only fault but it’s a big one. While neither of these sentences is truly ambiguous, a few well-placed commas would help the reader to parse them with less mental effort. A notable exception is Smith’s Gadgets, which, despite a high price, has managed to get significant international sales, most likely because of the high product quality and the brand of the supplier. In this scenario, the major share of consumer gadget spending will go to the large, traditionally business suppliers, helping maintain an oligopolistic situation in the electronic gadget market, hindering price competition. Still poor, but not nearly such tough going. Why do some corporate writers so strenuously avoid commas? The explanations that might apply to casual writing – it feels more conversational, it saves characters, the quality doesn’t really matter – don’t apply here. My pet theory is that some people think commas slow prose down, giving it a ponderous, even leisurely feel. They think commas mean pauses and they don’t want pauses. They’re high-powered executive business writers dammit they don’t have to stop and think and what they have to say is urgent! But pauses are not – not mainly – what commas are for. They are mainly to help the reader navigate the clause structure of the sentence without having to think about it. Used well, they make the sentence more likely to be read as intended without leading the reader up the garden path. Likewise, hyphens can help to show the reader what’s a compound modifier and what’s a noun phrase. In speech, we can vary things like speed and stress and pitch to help our words go down the right way. In writing, we have punctuation. So use it. It makes sense. Last night I went to Kings Place to see David Marsh and Nevile Gwynne debate grammar. They both spoke with a certain dry wit, even if they both lost focus at times. I’d read a fair bit of their stuff before, so I didn’t find the evening hugely informative, but it was interesting in any case. Here I’ll just look at one thing Gwynne said. He is firmly of the view that everything went wrong in the 1960s, when the teaching of grammar was abolished. This had catastrophic consequences for our language. “When I was eight or nine, everyone knew what a preposition was.” But no longer. A regular part of his pitch is that good grammar (by his definition) is necessary for thinking, and thinking is necessary for deciding, and deciding is necessary for happiness and society and civilisation itself, all of which are now breaking down because we split our infinitives and don’t know what the genitive case is. And he is very fond of preposterous overgeneralisations and of rose-tinted glasses. So perhaps I shouldn’t have been surprised when he said it. But I was. And so, from the sound of it, were most of the rest of the audience. When I was young there was no such thing as suicide. I didn’t get his next line down entirely, what with the sound of gobs being smacked, but he said the modern explosion of suicide was due to people “not thinking coherently” – a tragic result of their using ‘hopefully’ as a sentence adverb and saying ‘different to’ and such other brain-destroying, life-ruining horrors. I knew he was exaggerating. But what I didn’t know was that he was completely, utterly wrong. Suicide rates in males steadily increased by 67% from 1861 to reach a peak of 30.3 per 100 000 by 1905. Rates then decreased to 21 per 100 000 in 1917 (during World War I), increasing to reach a second peak of 30.3 per 100 000 in 1934, coinciding with the Great Depression. Subsequent declines were interrupted by small increases in the 1950s and 1980s. The lowest male suicide rate (11.6 per 100 000) was recorded in 2007. 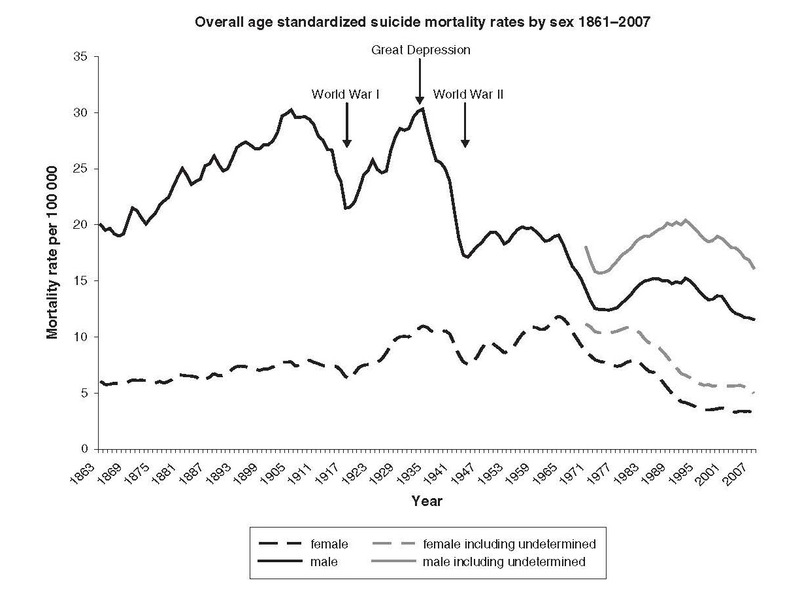 In contrast, suicide rates in females increased gradually from 6.0 per 100 000 in 1861, peaking at 11.8 deaths per 100 000 in 1964, with slight declines during the two world wars. The rates steadily declined in subsequent years and the lowest female rate (3.2 per 100 000) was seen in 2007. Modern grammar teaching coincides with the lowest suicide rates on record. My objection to Gwynne is not that he is conservative or uncompromising or authoritarian. My objection is that he is ignorant, incompetent and lazy. He literally doesn’t know what he’s talking about. I’ve blogged about him a few times before, and every time I come across him he’s a little bit more wrong. ‘It’s not a real word.’ Really? Monaco isn’t a real country. It’s less than a square mile of land with no military to speak of and a population that would make it the 200th biggest town in France. OK, it’s technically a member of the UN, but it’s basically just a casino with a beach. It isn’t a real country. Narnia isn’t a real country. It’s fictional and doesn’t actually exist. If you’re one of those people who like to say that ‘irregardless’ isn’t a real word, which way do you mean it? If you mean it in the first sense – that ‘irregardless’ is a shoddy excuse for a word, an illogical, clumsy and needless variation that dictionaries label as nonstandard and that it’s hardly possible to use without attracting a storm of criticism – then sure, it isn’t a real word. But if you mean it in the second sense, that ‘irregardless’ – as Suzan St Maur puts it – “doesn’t exist”, then you’re being silly. Of course it exists. People use it, and people understand it – even if you or they don’t like it. English is not perfect. That’s just a fact. Whatever your linguistic tastes, there will be parts of the language that you don’t like. And that may be annoying, but it doesn’t mean that those parts don’t exist. You’re free to avoid them, and to warn other people not to use them, but don’t pretend they aren’t there. The trick is to remember that acknowledging existence and endorsing worth are not the same thing. So if you mean ‘real’ as a value-judgement, then go ahead and denounce the unrealness of ‘irregardless’. But if people might take you to be making a patently absurd claim of non-existence, then maybe you could rephrase your complaint. The letters “UK” stand for unique, brilliant, creative, eccentric, ingenious. I’m going to assume that this isn’t the result of spectacular illiteracy. Instead, it’s a failure to watch out for ambiguity – but a pretty big failure. He meant “stand for” in the abstract sense of embodying values. But as we all know, and as he and his speechwriters somehow forgot, the phrase also has a narrower sense of explaining what initialisms mean. He primed his audience to expect this latter sense with his preceding mention of the letters UK, and then immediately strengthened that impression by having the first word in his list begin with U. The result is an agonisingly clumsy lump of rhetoric. Useless klutz.